This page uses a stylesheet. Please use browsers that support stylesheets. 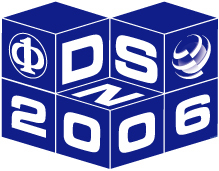 DSN has a 35-year history of being the premier conference on fault tolerance, reliability and security of computer systems, networks and software. It received generous financial sponsorship from select, leading industry every year by invitation. This year, we're opening the sponsorship opportunity to all corporations and government agencies that have an interest in advancing the state of technology for dependability of computer systems and networks. $50K or more: space to display a product/technology from the company and proper recognition with logos etc. These are some guidelines. We can discuss other possibilities and combinations. Please contact me and we can design a package that will meet your business needs. I look forward to seeing you in Philadelphia in June 2006! Special thanks to the following sponsors of DSN 2006. Without their generous support we would not be able to provide such an exciting conference. Send your comments and questions to webmaster dsn2006.org.